Most secondary schools, with the exception of selective ones, base their requirements for admission on how far prospective pupils live from the school. So what do you do if you do not live in the catchment area for a good school, and cannot – or will not – send your kids privately? For the lucky few, there are a handful of other ways of getting your child a place at a good state secondary school. One way is to secure them a music place, which is very competitive but worth it – if your child succeeds! Getting a music place is difficult, requiring not only musical ability on the part of your child, but intense logistical preparation on the part of the parent as well. As with all admissions to secondary school, it pays to start early – although with the relatively new introduction of musical aptitude tests being given in some schools (see below), your child may not need any former preparation in music whatsoever to get a place. Find out when the schools' Open Days are and, if possible, visit the schools when your child is still in Year 5. Get a copy of the prospectus and decide, along with your child, where to apply based on their own needs and requirements. Learn the admission deadlines. Every local authority will have its own admission deadlines, and nowadays, schools that are Academies might have their own deadlines as well. If you miss the deadline, it will be much more difficult to get your child into their preferred school. Ask for the supplementary admission form for music and fill this out, along with the general application form. The general form can often be filled in online; the supplementary admission form may have to be sent separately – and a lot earlier. Audition or take the musical aptitude test. In the past, an audition was usually all that was required to get a competitive music place. These days, however, some schools have scrapped this in favour of a musical aptitude test, which tests pupils' rhythm, melody, pitch and texture. In theory, these tests are considered non-discriminatory as they do not require any previous musical background or knowledge of music theory. You will have to find out which schools offer what. Many schools will require that children attain a certain level of proficiency before auditioning, such as a Grade 5 in piano or higher, or a Grade 3 in flute. Your child should start lessons early on to be able to reach this level by the time they apply at the beginning of Year 6 - that can mean as early as Year 2! For some schools, being in the primary school orchestra and participating regularly in other musical activities can help; other schools see this as irrelevant. Some schools require children to audition with more than one instrument, which can include voice. Find out what is required from the school you in interested in your child attending, and prepare accordingly. It can pay off to have your child audition with an instrument considered more unusual, such as trombone or oboe. 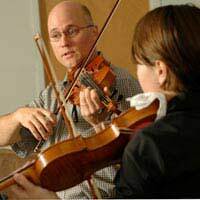 The competition with a less traditional instrument may also be easier, as literally hundreds of children may be competing for a music place playing the violin or piano. Don't lose out by being out of the loop. "The school I am interested in for my daughter has auditions in October, but this year they required that the supplementary admission form for music be filled out in July," said mum Julie Foster, whose daughter is applying for a music place in a north London school. "I learned about this change just in the nick of time." Always check the schools' websites to see if there are any changes. Some schools - not all - interview children they are interested in, to see how dedicated they are to music and how much it really plays a part in their life. Ask other parents of children who have applied to the schools you are interested in to see if an interview is important, and what it entails. Getting a music place in a state secondary school is very competitive, as most schools offer just ten percent of all school places –or less – based on musical ability. Still, if your child has spent the last five years practicing an instrument every day, or just has a natural ability and a love for music – then it's most definitely worth a try. I just finished a conversation with the York Council, in which they said there is not such thing as a supplementary admission form for music or anything similar; and, the admissions are solidly based on the catchment area. Neither, it seems to exist a secondary school around this area that prepares the kids for music grading or GCSE. Could somebody tell me where I could find that form and, maybe, a list of secondary schools with this option, please? @Mana - I have included a link to Special Needs UK, here which should help answer your questions. My son is a 13 years old, studying in an international school in HK.Recently he's been diagnosed as ASD as high functioning child. The school is providing simply academic learning support but no other support addressing his emotional and social behavioural needs.We are planning to move to London but we do not know how to start and to know the criteria of choosing the right school.We are targeting at North London Finchley where we are familiar of but we do not know it is a good area with schools for SEN.Also, we do not know how to choose either independent or state schools. Is it Sutton better than Finchley? Is there any state school with small sized class for SEN? Can anyone help? This blog post is very insightful. May I reblog it with full credits and links back to your site? I have many piano students sitting Music Aptitude tests for secondary schools and they would find this information most helpful.